Rubber flooring is a popular choice of floor covering in many locations, from public locations to private residences. Though it is known for its easy clean properties, it still needs some care and attention to preserve its original condition. In this article, we’re going to look at how you should clean rubber flooring. We’ll provide some specialist care tips that will ensure you can keep any space with a rubber floor clear, stain-free, and in the best condition possible for many years to come. Rubber flooring is one of the most durable and low-maintenance floor coverings around. The material itself is usually made from natural tree rubber or produced from a synthetic source, such as recycled car tyres. 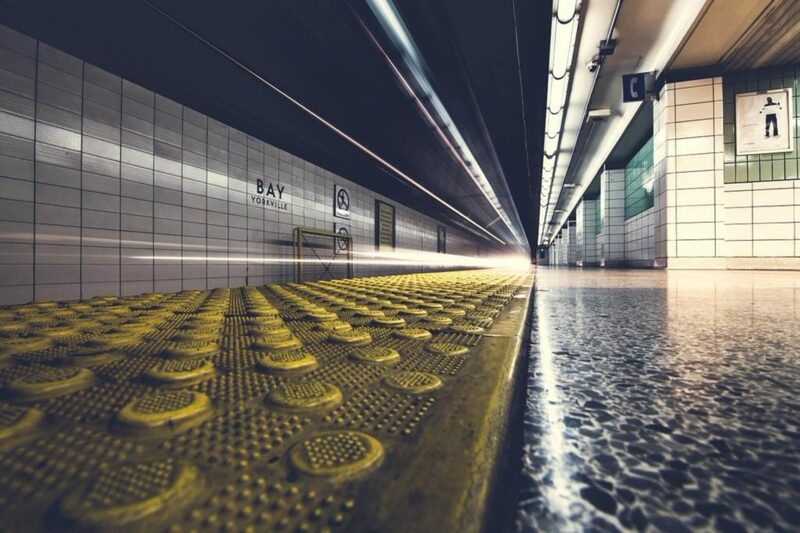 A rubber floor is inherently very resistant to impact and provides a good level of grip, making it a common choice in places with heavy footfall, such as train stations, airports, or shopping centres. 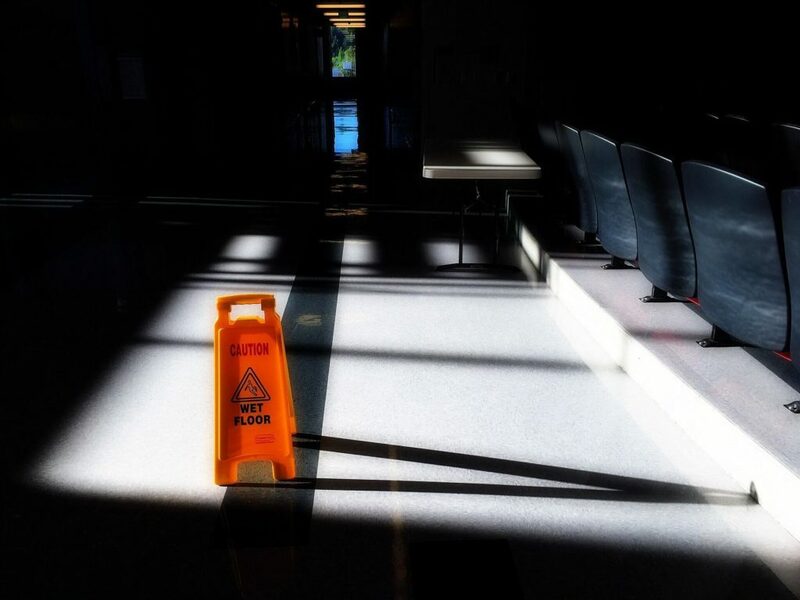 And, because it doesn’t absorb dirt, debris, or liquids, and is resistant to mould and mildew, it’s a popular option for locations where a high standard of hygiene is required, like hospitals, schools, and gyms. Rubber flooring is also becoming a popular choice in homes, especially for playrooms, home gyms, and kitchens. The flooring comes in sheets to cover large, open areas, as well as interlocking tiles that can be easily adapted when only a smaller section is required. There are studded varieties available too, when extra grip is needed in critical locations. How should I clean rubber flooring? As we’ve mentioned, rubber flooring is one of the most hardwearing coverings available. However, it still needs a good level of maintenance to preserve its qualities and keep it looking like new. In this section, we will aim to give you an insight into how to care for your rubber floor with some specialist cleaning tips and advice. When you have just had your rubber flooring put down, you may be tempted to give it a quick clean to get rid of any debris from the installation. If you have click-together or static-weight rubber matting, you can get to work straight away but, if your flooring is secured in place by an adhesive, you will need to wait at least 72 hours. This is to make sure that the glue has set, so there’s is no risk of the covering becoming dislodged. One of the most common maintenance tasks you will face with your rubber floor is small particles of dirt, dust, and debris being tracked in on the soles of people’s feet or blown through the door when it’s open. This tends to be more of a problem in locations with high footfall, though you can hugely reduce this issue by thinking ahead and investing in some dust control mats. These mats can be placed in front of points of entry or places where people will spend time standing around, such as the foot of a staircase or the front of a reception desk. A dust control mat will pick up and hold on to any particles tracked onto or brushed over their surface thanks to their specialised fibres. Then, the mats can be vacuumed or washed to get rid of unwanted debris they’ve collected. Just like any other flooring, rubber needs a regular cleaning regime to keep it looking and performing its best. We recommend that you undertake two separate maintenance cycles: daily/weekly and periodically, for light and deep cleaning respectively. Follow the advice below to come up with the ideal schedule for your rubber flooring. Before you undertake any cleaning of your rubber floor, it’s vital that you remove any particles that have been deposited as they can spoil the finish of your rubber flooring. Dust and debris can become abrasive if picked up and dragged across the surface by someone’s shoe, a mop, or a cleaning machine. It isn’t difficult to get rid of this loose debris, as it can easily be swept or vacuumed up in minutes, but it’s important to remember to do this before you commence cleaning. Once you’ve vacuumed or brushed up any loose debris, you should carry out a damp mopping of the rubber surface. This should be done daily if your flooring is in a business or public building, or weekly if in your home. Use a softer mop with water and a mild, PH neutral detergent, applying sparingly to avoid leaving any standing liquid on the surface. Also, be sure to change your water often, as you don’t want to be using contaminated water that will make the floor dirty again. As well as daily or weekly maintenance, you will also want to undertake a deep clean periodically to restore the floor to its original condition. 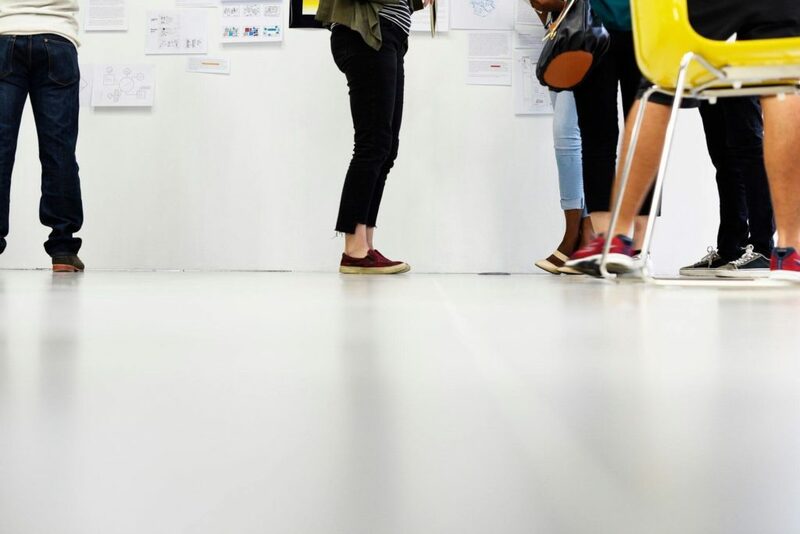 How often you decide to do this should depend on a number of factors, like how busy you are, how quickly your flooring becomes dirty, and whether your floor is in a business, public building, or residence. If you are maintaining a large space, we recommend that you use a floor cleaning machine to achieve the deepest clean possible. A walk-behind scrubber should be adequate for medium–large areas, but you may wish to consider a ride-on scrubber if you have a very large surface to cover. Add water combined with some mild PH neutral detergent to the machine, then go over the surface completely. When you’re done, leave the solution to work for ten minutes, before going back over the area again with clean water to rinse. Be sure to use a light floor cleaning brush with your machine when doing this job to avoid scratching the rubber, and change your water frequently. Lastly, remove any excess water from the surface by hand if required. Studded, ribbed, or other textured rubber flooring can be more stubborn, however, as grime has a habit of becoming trapped between the ridges where a regular brush doesn’t reach. 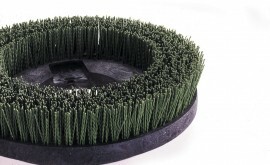 For this type of covering, you will need a studded rubber floor brush that has two bristle lengths to reach both the upper and lower levels of the surface. 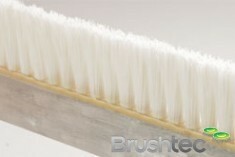 It has both soft and stiffer fibres to make sure the rubber is buffed and burnished in one go. As we’ve mentioned, water and mild detergent is enough to keep a rubber floor looking good. However, you should take care to avoid any cleaning agents or chemical products that are highly acidic or alkaline as they degrade the surface of the rubber. Also, take care to never use any product that contains turpentine, or another stripper or degreaser, as they will have a similar, undesirable effect. Rubber flooring is one of the most resilient kinds, with a fantastic resistance to liquids. Any unfortunate spillages will just sit on the surface, as the material won’t absorb it. However, there is one potential problem that can occur if you have rubber floor tiles or a prominent seam between rolls of flooring, and it all depends on what type of subfloor you have underneath. A plywood subfloor directly below the rubber layer can cause a problem, especially if any liquid manages to penetrate through the gap between tiles or flooring sections. Should the plywood come into contact with the liquid, there is the potential for rot and mould to form and cause further issues. If you know that there is a plywood subfloor, it’s worth having a moisture barrier underlayment installed between the two materials to prevent problems further down the line. If you want to restore the sheen of your rubber flooring, you can use a professional grade buffing machine and conditioner to get a like-new shine. When selecting your machine, you should make sure that you choose one that has the settings to operate at less than and up to 350 RPM, which is the upper limit for buffing polishing without risking damage to the flooring. You should also make sure your equipment has a high-quality brush installed, like those from our range of floor polishing brushes, to protect your flooring. Our attachments make use of premium-grade fibres and solid plastic fittings to create a brush that will deliver a professional result every time. For many rubber floors, following the regime described above is more than enough to keep it in superb shape. 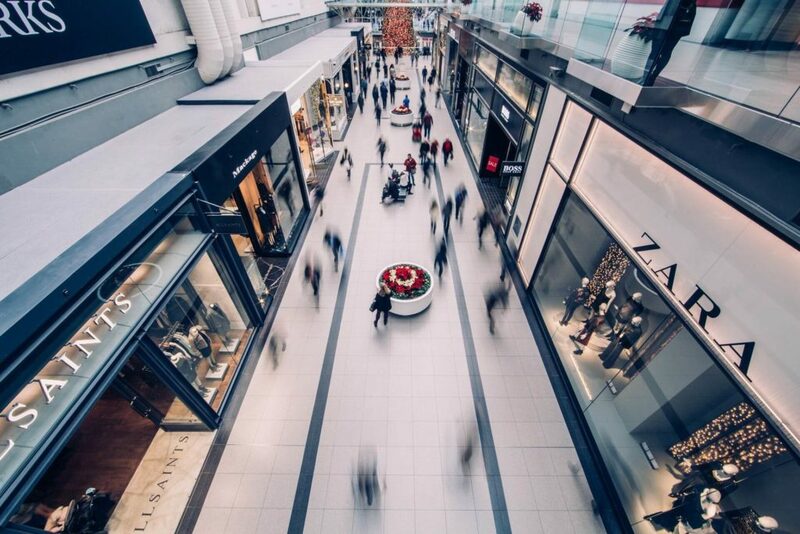 However, for flooring that experiences heavy footfall on a regular basis, you may wish to go a step further and protect it with some metallised emulsion. This type of product will add a gloss look, as well as an extra layer of defence against blemishes to the surface, so you won’t have to carry out additional cleaning each day. Most emulsion products require two or three coats to work as desired, with drying time between each stage. You also need to make sure that your floor has undergone a deep clean before you begin. Because this process can be time consuming, it can mean closing off a busy thoroughfare for a few hours at a time. You will probably need to plan ahead and factor this into any plans for floor maintenance. Follow the advice in this guide, and you will be able to keep your rubber flooring in the very best condition, as well as being able to clean up effectively when spills and accidents do happen. 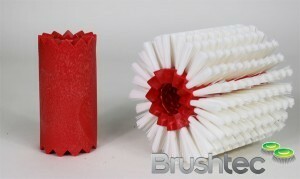 Here at Brushtec, we can cater to your specialist brushware needs with quality disk brushes and pad holders for your cleaning machines. We can also work with you to create a bespoke option to meet your requirements, so be sure to get in touch to discuss your options.